Since April 2017, the Agronutritional Cooperation of the Region of Crete has implemented a new program, co-funded by the European Union and Greece, which was approved and labeled “THE EUROPEAN FOOD MASTERS - TASTE THE AUTHENTIC”. This campaign seeks to encourage the recognition and therefore the consumption of PDOs, PGIs and organic products on the domestic and German market. At the same time, it accentuates the European origin and inherent quality of products as arguments for their promotion by professionals in the German market, which will lead to bigger sales. The action a bilateral one, since it is addressed to two member-states of the European Union, Greece and Germany. The core message of the program “THE EUROPEAN FOOD MASTERS” brings to light its European speci cations. The phrase “TASTE THE AUTHENTIC” refers directly to the categories of iconic and top agricultural products of the European Union, the PDOs, the PGIs & the BIOs produced in Crete. 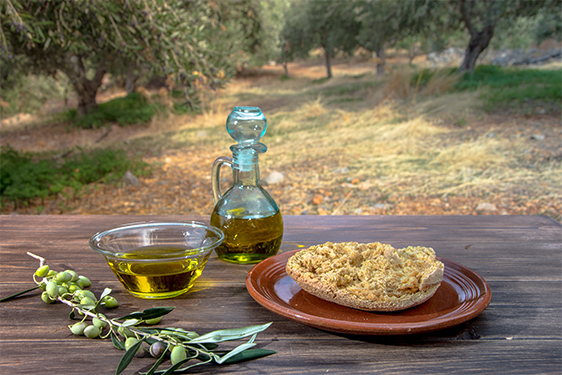 The Agronutritional Cooperation of the Region of Crete, founded in March 2012 and constituting a non-profit organization, aims at the publicity, promotion and marketing of Cretan quality products. Its goal is to link the primary sector with tourism and catering services and it constitutes an integral part of the wider business and strategic planning called “Agricultural Products Basket” of the Region of Crete. The main advantage of the organization is its institutional role, as it serves the farmer, the processor, the trader, the craftsman, the local community and the products in general, whilst ensuring a relationship of solvency and stability among them.